"He was a very nice, likable fellow and seemed to be very happy," remembers Loretta (Morrison) Roehrs about her mother's cousin Hilary Blake. "I didn't know much about Hillary. I just remember him coming to Grandma & Grandpa's when we were there. He always brought a "musical" ( I am thinking a guitar but could have been something else) instrument. I wouldn't have thought he would be one to be afraid that someone would break in an rob him. He was a very nice, likable fellow and seemed to be very happy." Hilary Blake was the first born child of Nora Blake and was born on Clover Fork in 1911. He was a grandson of John Jackson Blake and Ella (Foster) Blake. It was generally acknowledged that Hilary’s biological father was Bill Posey. In May, 1913, Nora married Ray Hall, the son of Strange Hall and Hestaline (Riffle) Hall. 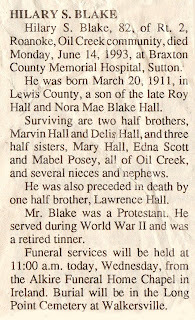 Hilary's obituary shows Ray Hall as Hilary's acknowledged father. In short order, Hilary had the sibling company of brothers Lawrence, Delis who was known as “Buddy”, and Marvin and sisters Mary, Edna and Mabel. 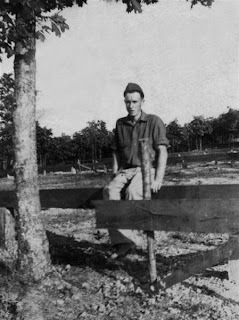 Dale Barnett recalls that when Hilary was young he would do a little work for Lee Blake who operated a saw mill on Clover Fork. Hilary was handy with his hands and worked in Lee’s shop doing repair work on the saw mill equipment, a little blacksmithing, building sleds, and maybe a little carpentry work. “Hilary would drift in and then drift out,” recalled Dale. Opal Blake Hall also recalls Hilary from her youth in Orlando. Hilary was considerably older than Opal but she would see him around Orlando frequently. She recalled that Hilary made dulcimers and concluded that Hilary must have done a lot of his work outside because he had a chronically sunburned neck. Click on the obituary to enlarge it. Being born into the musical Blake family gave young Hilary a good dousing in the fine art of music making. From an early age he became familiar not only with the playing of music but also the making of the instruments to play music. Gerald Milnes, the Folk Art Director at the Augusta Heritage Center, in his book about musical instrument making called Play of a Fiddle, mentioned Hilary as a “fiddle and dulcimer maker.” Milnes also noted the exceptional abilities of the Blake family of Clover Fork, among whom were Stewart Blake, “Bunk” Blake, Amos “Daddy” Blake, and “Tater” Blake in crafting fiddles and dulcimers. Above right: generic ductwork schematics. Below right: We have no photos yet of Hilary's duclcimers, but here are two examples of WV dulcimers roughly from Hilary's time, from the website of Ron Gibson. Right: We don't know what Hilary Blake's dulcimers looked like. Dulcimers can be made in many forms and kinds of wood. These two examples by contemporary craftsman Ron Gibson suggest the variety of designs possible. Hilary Blake remained on Oil Creek the remainder of his years. He would spend a little time with his sister Edna who lived down the road and would take some meals with her and her husband Scotty, but for the most part he stayed around his home. 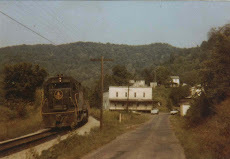 In June 1993 he fell ill and was taken to the Braxton County Memorial Hospital in Sutton where he died on June 14th. He was buried at the Long Point Cemetery in Walkersville. See the entry Music in the Hills: Making Instruments. Note 2: Milne's material on the Blakes' production of musical instruments connects Hilary strongly with his great uncle's, Steward McClung Blake's, family. (See Note 1). Perhaps there was also a connection in tin work? We know now that Hilary Blake was a tinner. Uncle Zeke reported in 1936 that Bunk Blake was making sugar scoops made out of tin cans which his neighbor Emory “Possum” Skinner was selling for him. Scoops were a traditional part of the old-time tinner's repertory. I recognize the dulcimers you show as being made Ron Gibson - not the Blake family. You should probably credit Mr. Gibson as the builder.